Spending a slightly restless night (an annoying mosquito kept buzzing our ears), we said our goodbyes to John and Yvonne, our gracious hosts of their gîte, Le Cerisier. 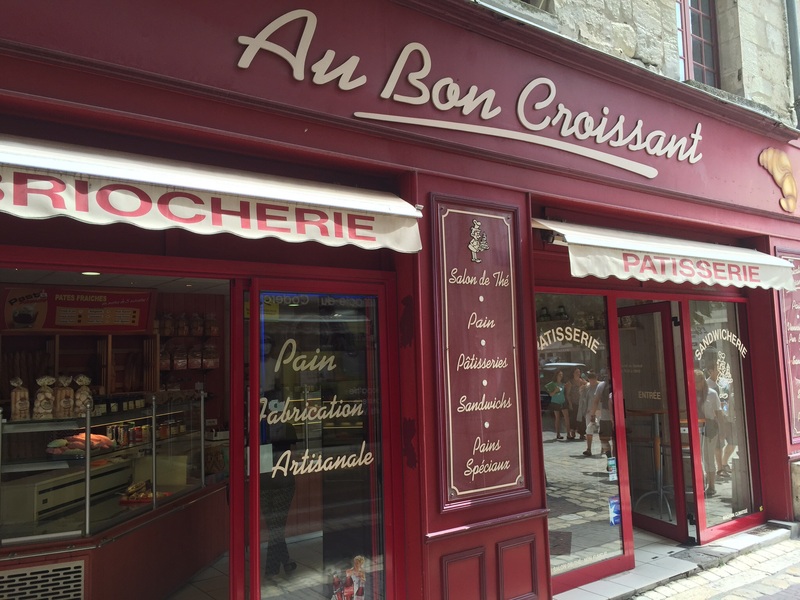 We picked up some pain au raisin for breakfast on the go and headed south to our next destination, Périgueux. Heading south we noticed that the terroir (the land) started changing. From gentle, low-rolling hills and open fields planted with grapes vines, wheat and sunflowers to hills with deeper valleys and forests of a variety of large mature trees. Along the way we passed through some charming villages with church spires poking at the overcast skies and chateaus seemingly everywhere. It was a wonderful drive through this beautiful part of the country. Périgueux was established in Roman times and has had several major events during its history that have added to the character of the city. Next to Bordeaux, Périgueux is the largest city in the northern part of the department with roughly 29,000 inhabitants. On our arrival, we parked near our next logging just a few blocks from the farmer’s market held on Saturdays and Wednesdays in the two plazas near the town center. 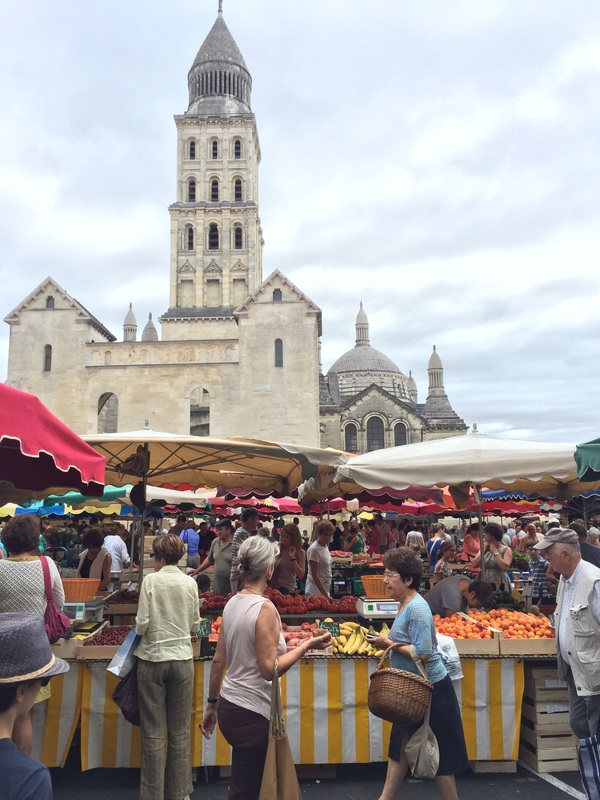 Saturday’s farmer’s market must be an important day to go out, purchase fresh fruits and vegetables, fresh bread, specialty meats and of course, foie gras. On entering the market, we were amazed to see what seemed to be the entire population of the city there. The two squares where the markets are held are by no means large, in fact, they are rather small. Nevertheless, every inch of space is made use of and what seems to be chaos is actually a very lively scene of people of all ages making their food purchases. Add to that the abundant cafes and restaurants lined with tiny tables and chairs that are fully occupied, the sights and sounds envelope you and can overwhelm the senses. 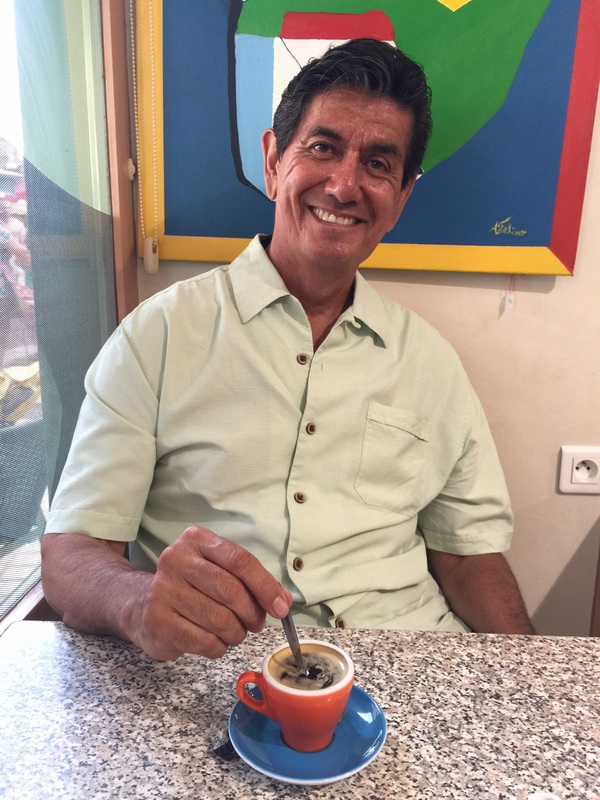 After shopping for a few items, veggies, fruit, fresh baked bread and, of course……foie gras, we settled into a corner cafe to sip on some coffee and tea as well as to plan the rest of our day. 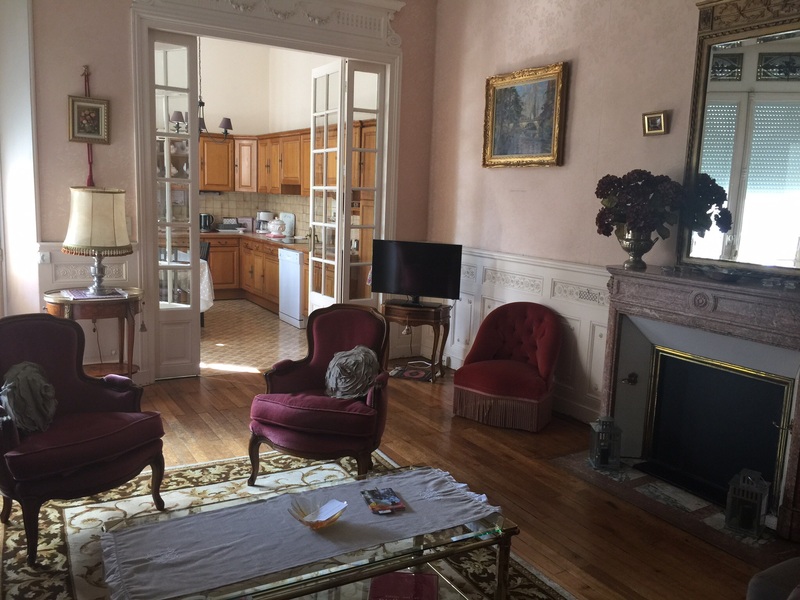 The location of our gîte is very close by and makes this an excellent location from which to explore the city. Our gîte is actually an entire apartment located on a quite side street. The apartment is owned by a mother and daughter who have owned it since 1960 and now rent it out. After relaxing at the cafe for a while, we took a walk through the streets of this area and discovered several small plazas tucked away among large shade trees. All of them had cafes and restaurants with tables set under the trees. We also strolled along the pietons or streets that were blocked off from cars, window shopping along all the varied boutiques, shops and stores that a larger city can offer. 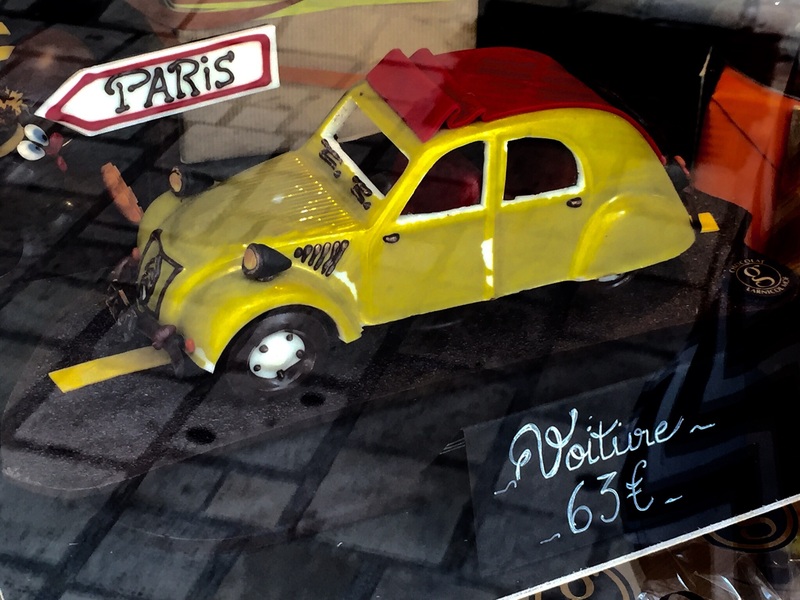 One of Cheryl’s favorite places to window shop is Le Chocolaterie, a very high end boutique offering exclusive chocolatey creations such as the replica of the iconic French car, the Deux Chaveaux. Three years ago when we were here, displayed in the window was a grand piano complete with bench, hinged top and sheet music. Another of Cheryl’s favorite things to do is shop at the “Soldes” that are offered only twice a year. 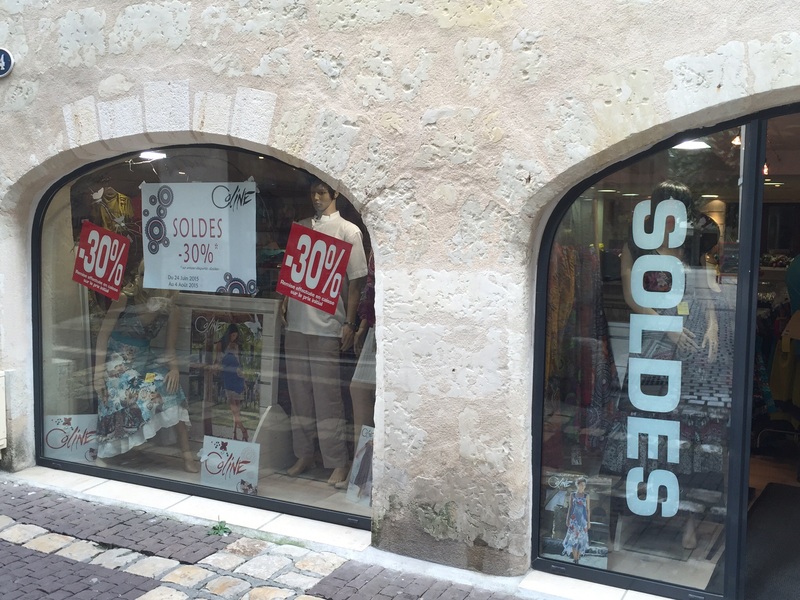 Unlike the U.S. where stores offer sales every week, “Soldes” (sales) are uncommon in France and occur only in June and January lasting 4-5 weeks. 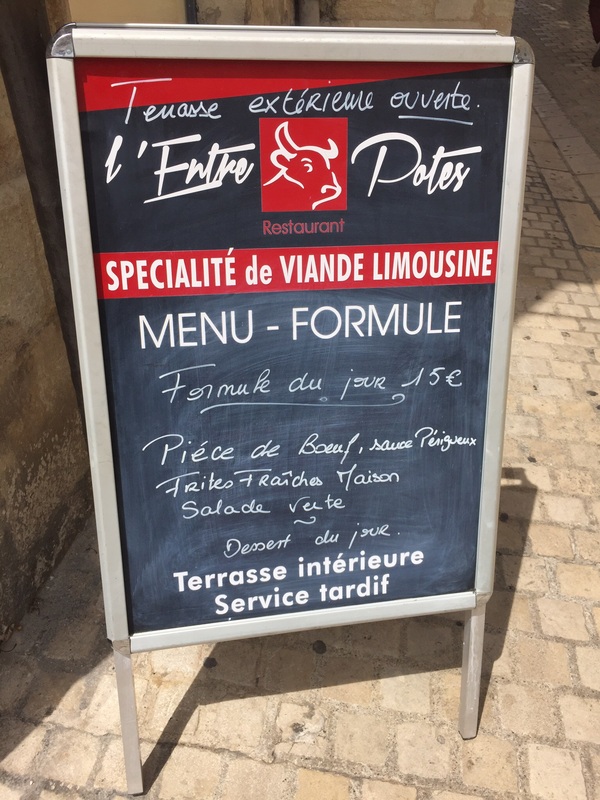 Restaurants and cafes are abundant here and most offer a lunch “special” known as the formule. It may include an entrée (appetizer), a plat (main dish), a dessert and sometimes includes a drink of your choice. All for a set price (tip, tax included). 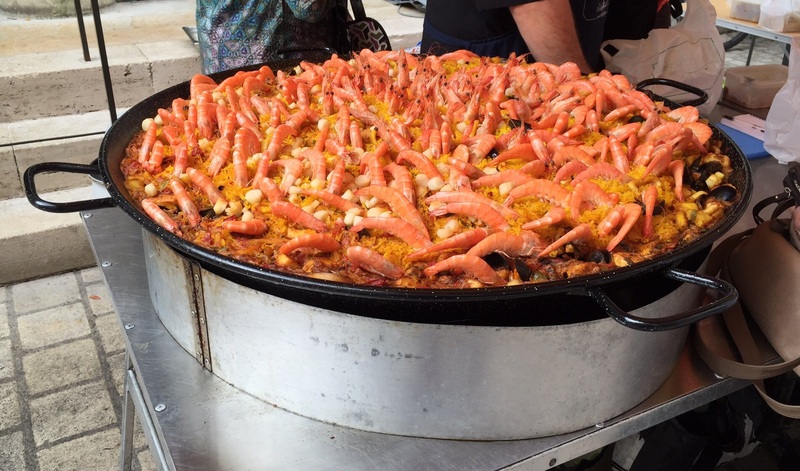 This is the best deal for your dollar…er..euro, but maybe more food than you want to eat. Those who want to eat something simpler or get something to go can usually get a variety of sandwiches, or baked goods in the many patisseries and sandwich shops that abound. Sandwiches here are unlike the U.S. version. They are more like sub sandwiches made from freshly baked baguettes stuffed with all kinds of cold cuts, cheeses etc. They are quite tasty and provide an easy meal for just a few euros. The Périgord area is famous for its gastronomy, Michelin starred restaurants, wonderful cafes, shops offering specialty items such as hand made chocolates, foie gras, truffles, and walnut-based products. We’re looking forward to exploring not only the city itself, but also the surrounding towns and villages.